One would expect developed countries with high rates of data consumption among its population would have highly competitive markets, and in turn keep data prices down. However, according to a recent study, this isn’t the case. Cable UK conducted a study comparing mobile data prices in 230 countries. It found that the expected difference in data costs, between advanced, developed, and underdeveloped countries, simply isn’t the case. In fact, the study shows that despite the relatively advanced and well-established mobile network infrastructure in developed countries like the United Kingdom (UK), United States (US), and Canada, the cost of data in these places are relatively pricier than those in less-advanced countries like Chile and Rwanda. 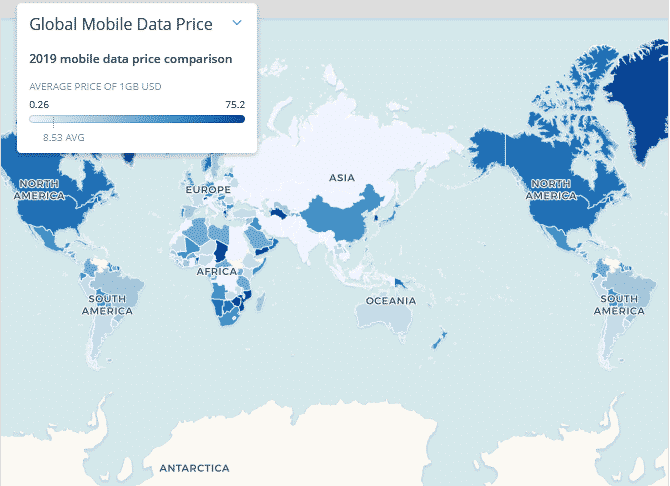 However, there are a handful of developed countries with enviable data prices. Australia is in the higher bounds of this list. According to the studies, the UK, ranked 136th, has some of the priciest data plans in Europe. The study also shows the US, ranked 182, has one of the most expensive rates globally, ranked 182nd. However, unlike these similarly developed countries, Australia placed 50th on the list, with an average cost of $2.47 per 1GB of data, which is many times lower than the global average of $8.53 per gig. Those prices are obviously hard to beat. But when compared to its peers — other highly developed nations — Australia takes the cake. In fact, in its own Oceania region, Australia is cited as the cheapest. 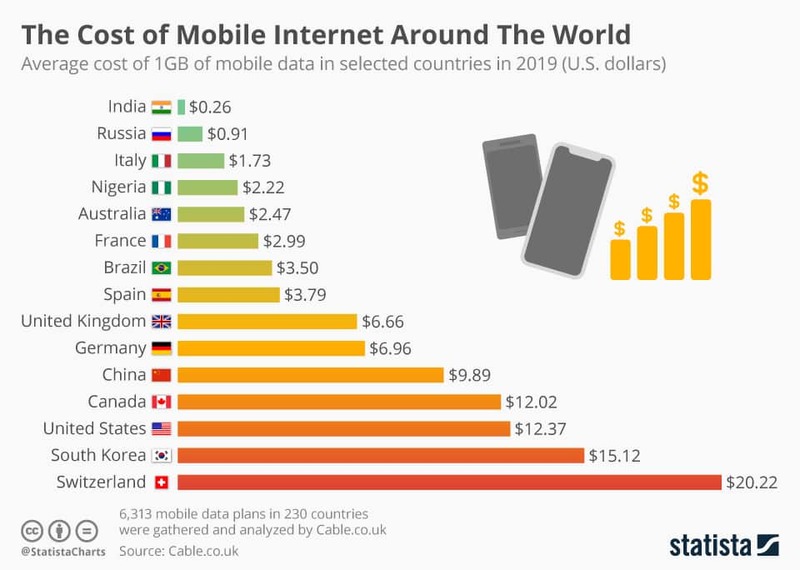 And we can even go further to say mobile data in Australia is some of the cheapest in the world, despite those alarmingly cheap rates in the top 5. Here’s a more thorough comparison between Australia and other countries around the globe, to show just how well we’re faring. Most of the pacific island nations that make up the Oceania region are at the expensive end of the list. At $30.09 per 1GB of data, Samoa is the most expensive in the region. Australia, by far the biggest country in the region, is also the cheapest with an average of $2.47. In next-door New Zealand, the cost is many times higher than Australia’s, with an average cost of $9.79. Like in many of their Oceanian counterparts, data plans in the majority of the Caribbean islands are quite expensive. They also come with relatively small data allowances. Among Caribbean island nations, only the Dominican Republic ($1.88) offers an average data cost that’s cheaper than that of Australia. The second and third cheapest averages in the region are those of Jamaica ($4.64) and Sint Maarten ($4.92) respectively. The two most developed countries in North America, Canada and the United States, both line up on the lowest bounds of the list. Canada’s average is $12.02 per 1GB of data, while the US is $12.37. Compare this to equally-developed Australia’s $2.47 and you’ll understand why this is a hot button issue for Canadians and Americans alike. The other two countries in the region are even worse, with the Bermuda averaging $37.76 per 1GB of data and Greenland at $16.79. Here, Finland offers the cheapest rates with an average of $1.16 per 1GB of data, with its vast range of unlimited data plans. There are other Western European countries that offer less rates than Australia, such as Denmark and Italy which average under $2. However, Australia beats out the UK by far, which averages $6.66 per 1GB of data. Australia’s $2.47 average also blows out Switzerland — but then again even the UK does, as Switzerland is has the most expensive rates in the region. As far as Europe as a whole is concerned though, Eastern European countries give Australia some solid competition: Poland (1.32), Romania ($1.89), Lithuania ($2.06), and Slovenia ($2.21). But Australia stands strong against similarly-developed nations in general. Australians are enjoying some of the cheapest data rates in the world. This is especially true when compared to similarly-developed nations like the UK, US, and Canada. Australia’s average rate per 1GB of data is a fraction of those countries, and a number of other highly developed countries in the world. Australia dwarfs these developed Asian countries, and so our rates still remain extremely cheap when compared to other advanced nations. As competitive as our mobile market is, our average rate is likely to drop even further, setting Australia’s data rates to become even more competitive on the world stage.